The Miniature X-ray Solar Spectrometer (MinXSS) CubeSat soft X-ray (SXR) spectra measured by the X-ray spectrometer (X123) SXR spectrometer is ideal for analyzing plasma properties above 1 MK. MinXSS-1 X123 can conduct solar spectral measurements from 0.8 – ~12 keV with an effective spectral resolution of roughly ~0.24 keV near 5.9 keV. These spectral measurements display important variations in the solar flux from quiescent conditions with minimal active regions, to active region dominated emission, to flares. The MinXSS x-ray photometer (XP) provides spectrally integrated measurements as a consistency check for the X123. The MinXSS full Sun integrated measurements are analogous to most stellar observations at this time, because with current technology, we cannot conduct spatially resolved measurements of other stars. Thus, MinXSS measurements are excellent for comparing how full sun integrated quantities are related to spatially variable quantities. Relationships derived could be implemented as a starting point in the analysis of other stars. Figure 1 (which is also Figure 10 in Moore et al. ) Panel A shows the X123 spectrally resolved energy measurements are displayed as a function of solar flux at 1 AU in mks units (W m-2 keV-1) and projected back to the surface of the sun in cgs units (erg s-1 cm-2 keV-1). Also displayed is the MinXSS measured energy content for photons ≥ 1 keV. The data in Panels B, C, and D are from the MinXSS-1 primary science mission lifetime during 6/16/2016 – 4/25/2017. Panel B is a plot of X123 counts vs. X123 derived energy content for photons ≥ 1 keV, which strongly correlate as they should. Displayed is a powerlaw fit of the form y = a*xb, where x is the X1123 counts and y is the X123 energy content. Because b ~1, the important result of this fit is that the relation between the total energy content above 1 keV is approximately related to the X123 summed counts across the spectrum by the scale factor 2.4 x 10-8. Panel C shows the correlation of MinXSS-1 X123 and XP counts vs. the Geostationary Operational Environmental Satellites (GOES) X-ray Sensor (XRS) energy fluxes between 0.1 – 0.8 nm (1.55 – 12.4 keV). The data correlate positively over the solar flux levels. Panel D demonstrates the strong correlation between the GOES 0.1 – 0.8 nm energy flux and the X123 photon energy flux ≥ 1 keV. This plot shows the strongest of all relationships in this nugget. The linear (y = rx + w) fit demonstrates a small offset (w = 5.9 x 10-8) and a scale factor (r = 0.9 x 10-0) to connect the two values. 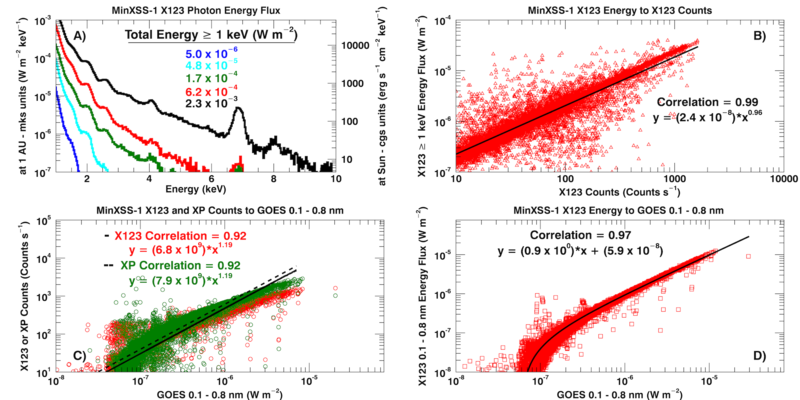 These plots demonstrate the functionality and utility of MinXSS X123 and XP data to the field of solar physics. Figure 1. Panel A shows the MinXSS-1 X123 derived photon energy flux at 1 AU (in mks units – W m-2 keV-1) and scaled back to the Solar surface (in cgs units – erg s-1 cm-2 keV-1). The total energy flux at 1 AU as measured by MinXSS-1 for photon energies ≥ 1 keV is listed for the GOES ~A5 (blue), B5 (cyan), C2.7 (green), M1.2 (red) and M5.0 (black) class observations. Panels B – D contain scatter plots, correlation coefficients and linear fit of MinXSS-1 X123 photon energy ≥ 1 keV to count rate (Panel B), MinXSS-1 X123/XP count rate to GOES 0.1 – 0.8 nm flux (Panel C) and MinXSS-1 X123 photon energy flux integrated from 0.1 – 0.8 nm (~1.55 – 12.4 keV) to GOES XRS 0.1 – 0.8 nm flux (Panel D) all show very strong correlations, validating the MinXSS data.. This is Figure 10 in Moore et al. .
Moore, C. S., Caspi, A., Woods, T. N., Chamberlin, P. C., Dennis, B. C., Jones, A., Mason, J. P., Schwartz, R., Tolbert, K. A., Solar Physics, “The Instruments of the Miniature X-ray Solar Spectrometer (MinXSS) CubeSats”, Sol Phys (2018) 293: 21.